In most of our articles we talk about how moving is a stressful process. That is why we share some helpful tips to make your moving experience easy and stress-free. However, sometimes after the move, most people don’t know where to start to get settled in in their new home. A year ago, our article discussed some of the things you should do after moving. In this article, we put together a checklist to help you get started on your post-moving tasks. After the move, you have limited time to report any damaged or missing items, the wise thing to do is to make sure everything is there and in the same condition. You can do a quick inspection of your valuables and make sure everything is in same condition as it was when picked up. Lower the risk of damage to your items by selecting a reputable moving company. In case you find anything missing or damaged, don’t hesitate to contact the moving company. Ideally, we recommend activating your main utilities before moving. If for some reason you did not do this, you should do this as soon as you can. You need to have at least the water and electricity turned on and ready for you. Get your essential rooms ready. Unless you plan on staying in a hotel until everything in your new home is organized, the bedrooms and the bathrooms should be set up for normal use. You can also start unpacking any essential boxes like your bathroom supplies, bed covers and sheets to help you get going. The kitchen is also an essential room, but depending on your needs, you may decide to organize it later. Especially after cleaning and unpacking most of your boxes. This will not only help you know how to organize and clean your home after you have unpacked everything, it will also help you avoid any safety hazards. Now that you’ve covered the basics, it’s time to start putting everything in place. However, before assembling the furniture and setting up major appliances, you might need to do a thorough cleaning of the house while you still have the open space. This will help you even more if you have pets. Some animals like dogs and cats have a developed sense of smell and you don’t want them smelling the traces left by the previous pets. The process of organizing and arranging might take long so plan it carefully. You might choose to also do your decorations during this process to give your new home the look you’ve always wanted. If you have kids, you probably already made arrangements for their new school before the move; if not, this is the time. Most people decide to plan their move during the summer when kids are not in school. This gives them time to get familiar with the neighborhood before school starts, and perhaps make new friends. Moving to a new location affects everyone in the family, even pets. If you have kids, you may need to help them feel comfortable in their new home. It might take some time for your pets to get used to the strange new environment. Sparing some time and planning activities that will help you spend a lot of time together will help everyone adjust quickly. After all, the only familiar thing you’ve got in common is each other. You did it! You are finally done with moving. I think that is a good cause for celebration. (Even if some adjustments might take a while to be made.) At least you’ve got the basics done and are ready to move on with your normal life. If you have any questions about your future moving plans, give us a call today at 972-487-5843. 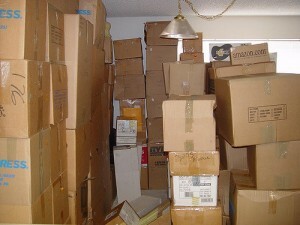 This entry was posted in Stress Free Moving Tips and tagged After The Move, Moving Tips. Bookmark the permalink.